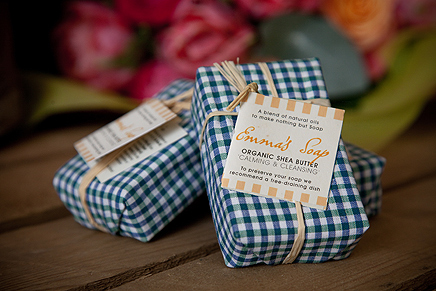 Emma's Soap bar 85g - Organic Shea Butter is extremely moisturising, gentle and nourishes the skin. A good bar for the shower or bath. 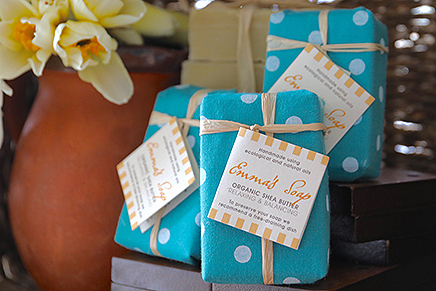 Organic Shea Butter gives a luxury bar giving a silky feeling. 'Calming & Cleansing' essential oil combination calms and balances the mind whilst emotionally & physically cleanses. Gives a smell of roses. 'Relaxing & Balancing' essential oil combination relaxes and balances the mind with a feeling of deep softness. Powerful Geranium scent. Ingredients: Sodium olivate (Extra Virgin Olive oil), Aqua (Water), Sodium sweetalmondate (Sweet almond oil), Sodium cocoate (Organic Coconut oil), Sodium sheabutterate (Organic Shea butter), Cera alba (Beeswax), Glycerine, *Cymbopogon martinii (Palmarosa oil), *Pelargonium graveolens et rosa (Rose geranium oil), *Cinnamomum camphora (Howood oil). *Contains: Geraniol, Citronellol, Linalool. Natural constituent of essential oils listed.